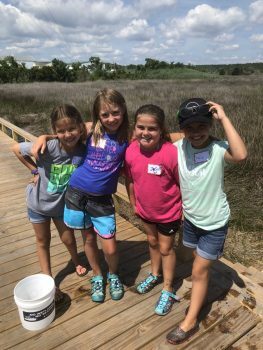 Even though school’s out for the summer, environmental education continues at the North Carolina Coastal Federation. The Wanchese office educated several student groups toward the end of June, spending time on the grounds of the office and at the North Carolina Aquarium on Roanoke Island. Jr. Aquatic Adventures, a summer camp at the aquarium, visited the Wanchese office for an oyster education program with Sara Hallas, coastal education coordinator, and Reilly Kelly, AmeriCorps member. They learned about the oyster life cycle, did an oyster dissection activity and placed 150 oyster shell bags on the 150-foot reef outside the office. 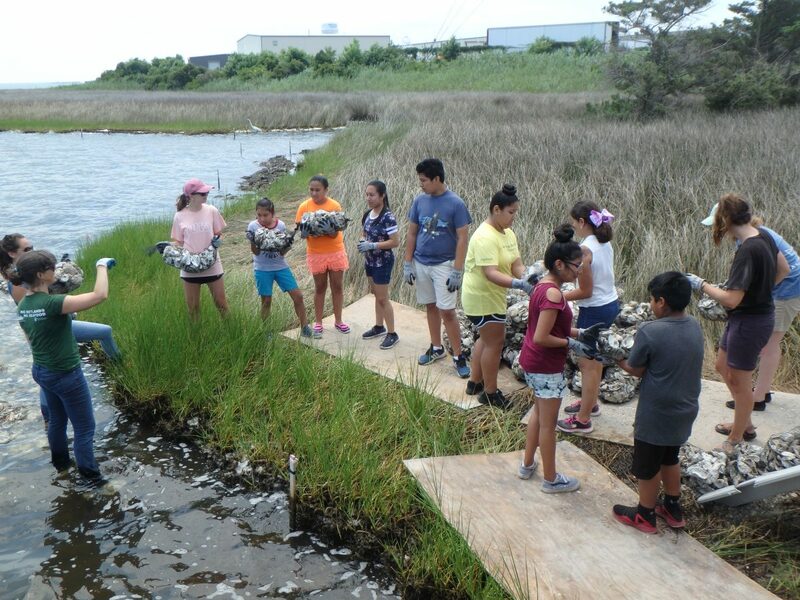 The following day, Sea Change Partnership OBX went to the office as part of its five-week summer program. 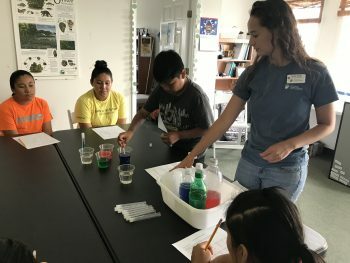 Sea Change Partnership OBX works with Latino families living in the Outer Banks “to promote education and encourage cross cultural understanding.” The organization aims to create family learning opportunities by partnering with organizations like the federation. During the first lesson, students learned about estuaries and brackish water through a “Marsh Mystery Water Lab.” Students compared four water samples by layering them to see which is more dense — ocean, sound, tidal creek and river. 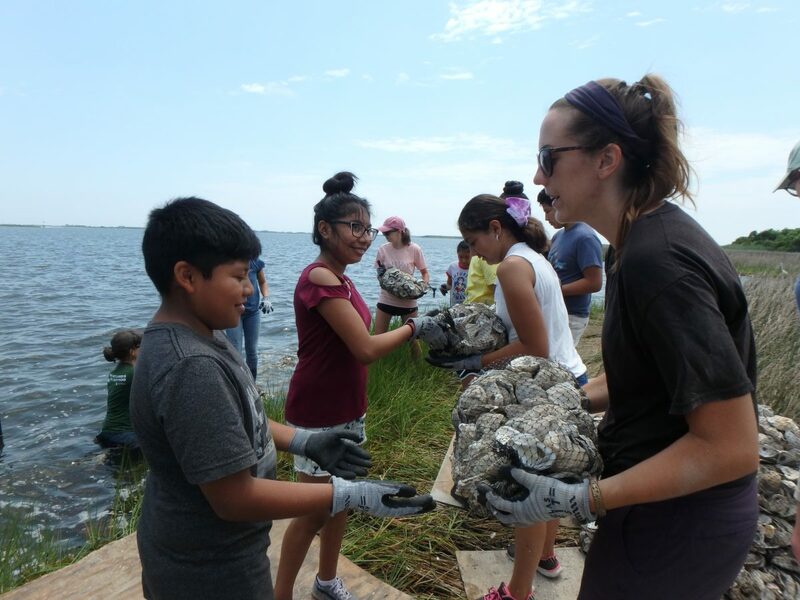 These students also learned about oysters and completed the deployment of the office’s oyster shell bags for the timebeing. They placed about 200 shell bags on the reef, which will help reduce shoreline erosion while providing habitat for fish and other animals. They again visited the next week to continue learning about water density and stormwater runoff. Students dropped different objects into the different water samples to see what would float and what would sink. They found that cherries sank, but tomatoes floated. To continue their lessons on stormwater quality, Hallas took students on an LID tour, where they saw rain gardens, pervious pavement and rain barrels and learned how these retrofits work with living shorelines to reduce stormwater runoff and improve water quality. 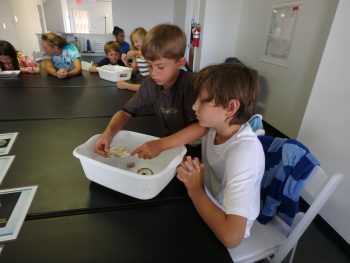 The Sea Change Partnership OBX will be visiting the office three more times in July, building on their lessons each week. 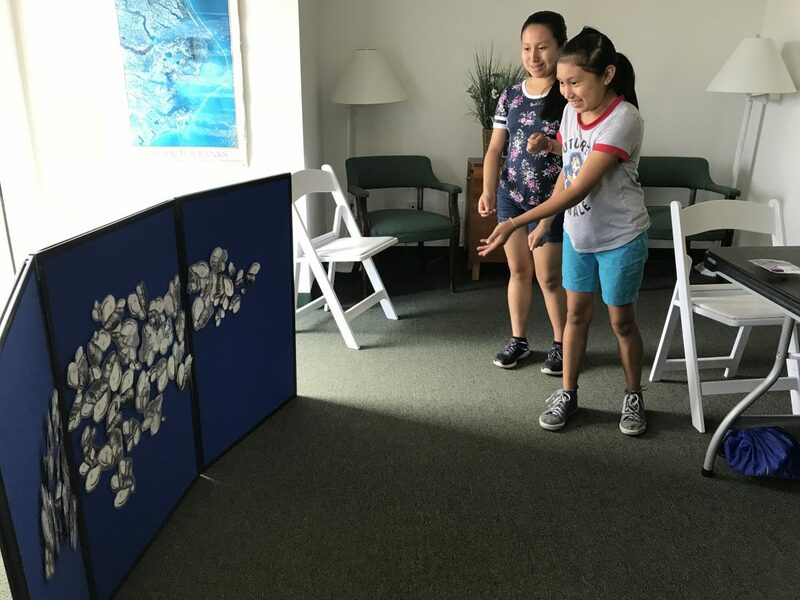 Another summer group with the Dare County 4-H program also spent a morning at the Wanchese office learning about oysters. These students participated in a scavenger hunt along the shoreline and learned about various marine creatures. 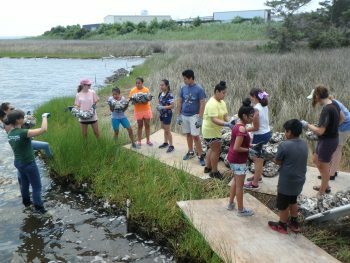 Staff and volunteers pulled seine nets and found brown shrimp, juvenile fish and crabs. Paige Fuselier, a 4-H extension agent, said the students and teachers had an awesome time during the activity. All three groups checked the basic water parameters while on site using the new dock, including dissolved oxygen, temperature and salinity. These stats will be tracked all summer to keep an eye on the status of the habitat. 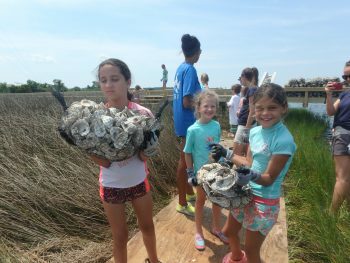 Watch a drone video featuring students from Sea Change OBX. Read a blog post about Sea Change OBX students’ experiences.